A group of nearly 30 CEOs and senior executives representing linen, uniform, garment and facility services companies serving the healthcare sector discussed market trends including managing changing customer relationships and expectations, healthcare consolidation, linen utilization and loss, reusables vs. disposable, expanding the market and automation. 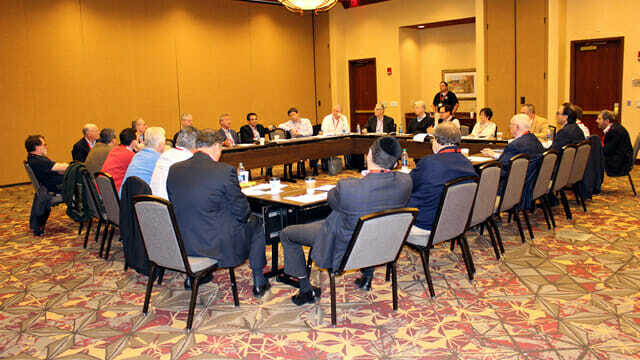 The TRSA CEO/Executive Roundtable was held prior to TRSA’s 7th Healthcare Conference last week in Charlotte which attracted nearly 200 healthcare market leaders and suppliers. TRSA Vice President of Government Relations Kevin Schwalb kicked-off the CEO/Executive Roundtable with an overview of government issues emphasizing the importance of state, local and non-government agency (NGO) regulation. He cited a recent victory in California that led to a relaxing of the antiquated “Title 22” requirement for laundering healthcare textiles, as well as TRSA member participation on the New York City Clean Act Task Force and efforts to limit promulgation of any new cleanliness standards based on recent revisions to the New York City laundry licensing requirements. TRSA President and CEO Joseph Ricci emphasized the important and critical role of local, grassroots support in educating and establishing relationships. “Legislators and regulators want to talk to linen and uniform professionals that operate plants in their district or state,” Ricci said, noting the personal involvement of representatives from member companies, including Mission Linen, Aramark and Encore for their assistance in helping to communicate the benefits of CA Title 22 revisions. The roundtable discussion, which ran nearly two hours, soon shifted to broad-based industry threats, trends and opportunities. A key concern among the operators is the “commoditization” of linen services, or as one operator put it the “Wal-Martization” of the industry’s efforts to provide linens and garments to acute and outpatient healthcare institutions. Ricci noted that TRSA and its members have been helping educate healthcare officials through research and white papers, as well as creating training materials, such as the Six C’s for Handling Soiled Linen in a Healthcare Environment that the association has distributed to thousands of healthcare providers. As for growth, the roundtable’s discussion centered on two key areas: converting nursing home on-premise laundries to outsourcing and the recent expansion of the outpatient garment business. One operator explained that economics and labor availability, coupled with a growing number of retirees, is driving nursing homes to turn to outsourcing. “The long-term care industry is going to explode in the next 5-10 years,” he said. “As the minimum wage goes up, there’s no way to automate an on-site laundry. It’s 45 pounds per operator hour on a good day. It could get worse.” Labor in many jurisdictions such as New Jersey and New York City are either reaching or edging close to $15 an hour. A job with benefits moves that figure closer to $20 an hour. On top of the labor costs, the availability of employees for meal preparation or patient care is shrinking. Closing a nursing home OPL can free up a number of positions for redeployment to care-related or other service jobs. While processing the personal clothing of nursing home residents is more complicated and costly for an outsource laundry, it can be done and can be part of a deal to get the more lucrative flatwork business. Demand for outpatient medical garments also is growing quickly as procedures move to clinics with short-term stays, rather than hospitals, several operators confirmed. The increased use of dispensing machines for scrubs or flatwork can help control losses and boost laundry bottom lines as well as customer satisfaction. Hospital-acquired infections (HAIs) continue to be a growing operational and financial concern for healthcare institutions, threatening not only patients but also the financial health of hospitals as insurance providers and government agencies such as Medicare and Medicaid will not cover costs associated with HAIs. The roundtable attendees discussed a range of options for addressing this concern, including generating awareness and educating customers on best practices and the use of antimicrobial textiles and chemicals. There was some concern over the impact of silver and copper-infused textiles creating “unintended consequences” in equipment performance, maintenance and wastewater. At least two operators who are currently using antimicrobials said they have not experienced any problems with effluent from using these products; adding that hospitals are willing to pay a premium for these textiles. On a related issue, the roundtable participants concluded their discussion with a review of a “megatrend” of resistance to “single-use” plastics such as soda straws and how this sensitivity could one day extend to the plastics used to protect healthcare textiles shipped from laundries to hospitals. Cadillac Uniform & Linen Supply Inc.
Economy Linen & Towel Service Inc.
For more information on the roundtable, or for details on similar events planned for the future, contact Ricci at jricci@trsa.org.